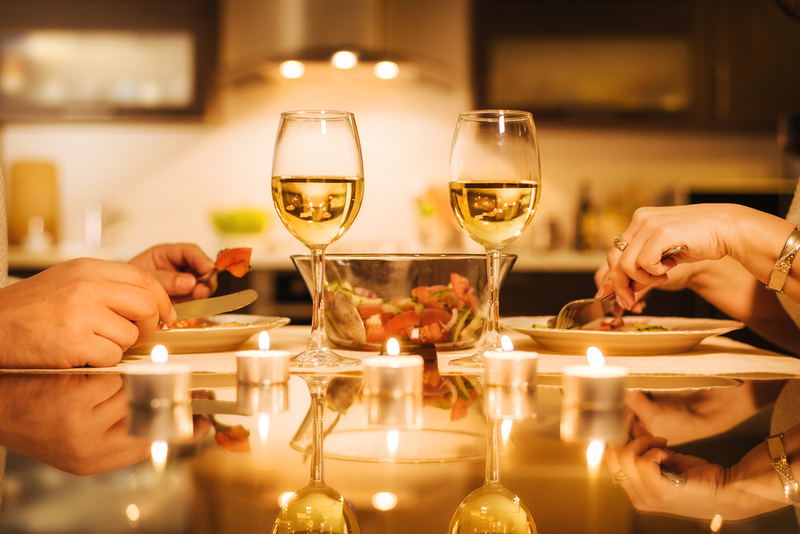 You’ve made it through the first few dates and now you’re ready to take the next step: inviting your love interest into your home for a date night in. Your home says a lot about you, so make sure that you create a positive impression by taking the following steps to get your place ready for the big night. Thoroughly clean your home in preparation for your date. Allow plenty of time to declutter, clean the bathroom, tidy any room your date may be in and give the kitchen a good scrub. If you don’t have the time to do it all yourself, splurge and have a cleaning service come in to do it. If you will be cooking for your date, it is especially important that your kitchen is clean and orderly. No one wants to eat anything that is made in an unkempt kitchen. The dishes, cutlery and glassware that you’ll be using for your date should all be scrubbed and free of water spots. Empty the dishwasher, put out fresh kitchen towels and make sure that your cabinets are orderly so that you will have easy access to everything that you need to prepare the meal. To create a romantic ambiance, focus on lighting, adding soft textures and selecting the right background music. Create a warm romantic glow with a mix of lamp lighting and candlelight instead of overhead lighting. Use light bulbs that give off a nice warm light instead of a cool blue light, which can be harsh on the eyes. Candlelight is a simple way to warm up a space, but be sure to use unscented candles to avoid overpowering the room with a fragrance. Set up the candles in sturdy candle holders to keep the melted wax safely contained. Soften up the seating areas in your living room with a few freshly fluffed throw pillows in fabrics that are soft to the touch. Add a cozy knit blanket or a faux fur throw over the couch to create an inviting environment to cuddle up while deep in conversation. Add music to keep the mood light and avoid any awkward silences. Your music choice says a lot about you, so make careful selections to send the right message to your date. If you are stumped about what to choose, check out the curated playlists on an app like Spotify, where you can browse by mood to get the tunes just right. On the night of your date, be sure to do as much prep work as you can before your date arrives. Do all of the necessary chopping and any other steps ahead of time that you can. This way, you can easily clean up as you go and avoid having a sink full of dirty dishes that need to be tackled after dinner. It can be a little nerve-wracking having a new love interest in your home for the first time, but with a little planning and thoughtful preparation, you can easily make it a success. By starting with a thorough cleaning, crafting the perfect ambiance and prepping your meal ahead of time, you can make the evening stress-free and fun for both of you.